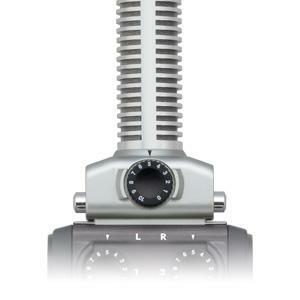 Features two additional combo jacks that accept either XLR or ¼” balanced (TRS) or unbalanced (TS) connectors. With the use of the Pad switch, the H6 can input 30dB louder signal and 14dB softer signal than any other Handy Recorder model on the market. The built-in instrumentation amp allows signals to be transmitted with minimal noise even when long cables are used. You can never have too many inputs. Zoom’s EXH-6 expander module adds two more combo XLR/TRS inputs to your H5 or H6, allowing you to connect extra microphones or line-level devices like mixers and portable music players. 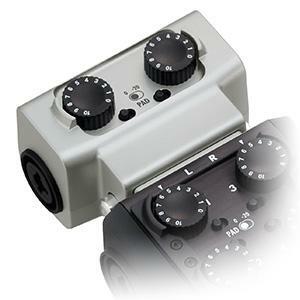 It turns the H5 into a four-input recorder and makes the H6 the smallest six-input recorder on the planet! The EXH-6 allows you to connect up to six external microphones or line-level sources to your H6, and up to four mics or line-level devices to your H5. Plug it in and enjoy the power of a portable studio in the palm of your hands. Professional photographers and videographers choose the right lens to capture the optimum visual image. Why should audio be any different? 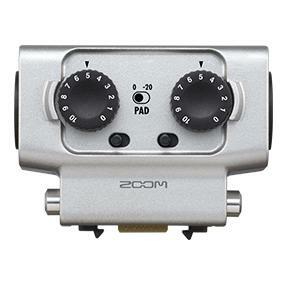 Zoom’s unique system of interchangeable input capsules allow you to always use the right microphone for the audio recording you’re creating. The capsules snap on in seconds, allowing them to be swapped out as easily as the lens of a camera. 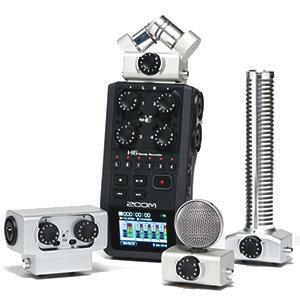 Zoom provides plenty of variety, too: Two different X/Y stereo mics for live music and concert recording, two different mid-side mics (one standard and one shotgun) for film and videography, two types of shotgun mics (one mono and one stereo), even an expander capsule that allows you to connect two additional external microphones or line-level sources. The SGH-6 monophonic Shotgun mic capsule allows dialogue and narration to be recorded at a distance, without an obtrusive mic in the scene, making it perfect for film and video shoots, live theater, and ENG (electronic newsgathering) applications.